Looking around your office workstation design can offer new insights into your work productivity and health. Countless hours spent hunched over typing away at the computer with little change in position can lead to potential work-related injuries. 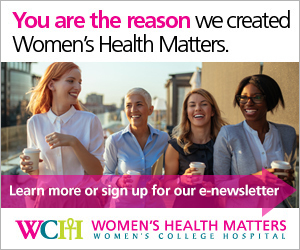 Women’s Health Matters spoke to Christine Weidner, registered safety professional at Women’s College Hospital, about the importance of incorporating ergonomics in any workplace setting, and how it benefits employee workload as well as your health. “Ergonomics addresses awkward postures that are held frequently for long portions of the workday. Awkward postures deviate from neutral or comfortable positions,” says Weidner. Practicing good ergonomics at your desk ensures that any task you have accomplished throughout the day has put little or no strain on your body. Finding the perfect fit and position while sitting at your office chair will enable you to optimize tasks and work at a comfortable pace. According to Weidner, employees have the potential to develop musculoskeletal disorders, also known as MSDs, from uncomfortable movements and strain at their desk. This work-related injury is quite common, especially if ergonomics have never been addressed at the office. Becoming so involved at work that you forget to take breaks can also lead to potential MSDs. Minor posture adjustments such as getting up from your seat and varying tasks can help to refresh any long workday. Movement is important for minimizing fatigue and static effort of the muscles. Simple adjustments such as ensuring that the lumbar support on your chair fits in the hollow of your lower back, and making sure your feet are either flat on the floor, or on a footrest. The monitor height should also allow the top row of text to be aligned with your horizontal line of sight. There are several ways to prevent any occurance of MSDs in your workplace in order to have a healthy office environment. To ensure that your computer work-station doesn’t become a hazard site, get an expert opinion by enlisting a safety specialist to do a work station assessment. A comfortable posture and an organized workspace can be part of your daily routine by simply integrating ergonomics. Weidner also agrees that ergonomics will make for happy employees and an even more productive atmosphere. “When workers are not tired, uncomfortable or in pain, they can achieve higher performance goals,” says Weidner.